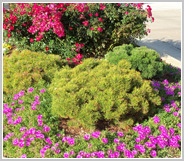 Welcome to EWF providing landscaping design, installation and snow removal in the Oklahoma City, OK metropolitan area. EWF is a full-service, licensed and insured landscaping company serving residential and commercial customers in the Oklahoma City metropolitan area for more than 15 years. 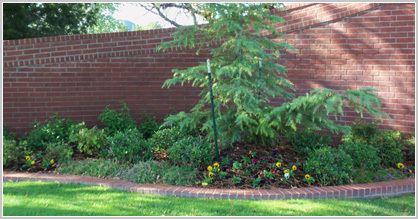 We offer a full assortment of landscaping, lawn maintenance and snow removal services. Among our many landscaping and lawn maintenance services are expert landscape design; sprinkler system design and installation; mowing; seeding and sod; fertilization, flowerbed design and upkeep; tree-removal and weed and bug control. For a complete list of our landscaping and maintenance services please visit our Services page. To meet all you outdoor living needs, EWF also is available to assist you with your hard-scape needs including such design elements as the design and installation of tile, rock and concrete patios, fencing and fire pits & grills as well as outdoor kitchens. During the winter season, EWF provides residential and commercial snow removal services to help ensure safe exiting and entrance to your home or business. Included in our winter service are plowing, walkway shoveling and de-icing. We also offer firewood service, so you can stay warm and cozy by the fireplace all winter long. In the spirit of the holidays, EWF will even help you put up outdoor Christmas lights. Our courtesy and experienced staff serves more than 200 satisfied customers each week. EWF looks forward to helping you achieve your landscaping dreams and meet your lawn maintenance needs on-time and affordable. Please browse around our web site for awhile. If you have any questions or would like a quote, contact us, we're here to help. Copyright © EWF Landscaping & Lawn Maintenance, 2011. All rights reserved. | Designed by MarketJuice.com by Deluxe!